On July 8th, Dennis Riordan, distinguished appellate attorney, will argue Edgar Steele's appeal in Portland, Oregon before the Ninth Circuit Court of Appeals. Following the hearing, attorney Wesley Hoyt and Cyndi Steele will hold a press conference in front of the Courthouse to release copies of the 2-1/2 hour video expose', "Witness to the Persecution - The Plot to Silence Edgar Steele, documenting their side of the case. According to the appeal, the defense was unaware that Edgar's attorney was being investigated for various felonies. The Denver Post reported on June 30, 2010 that Robert McAllister was being investigated for wire fraud and money laundering. He pled guilty on May 24, 2012 and told the Post he felt he provide inadequate representation to "a client convicted earlier in the year of murder for hire." During the 2011 trial, the defense was unaware that Edgar's attorney, Robert T. McAllister, was being investigated for felonies during the Steele trial and was indicted in July 2011 by the same US Government that was prosecuting Steele. McAllister was quoted by the Denver Post, "Two months later, McAllister told a judge in Idaho that he had provided ineffective counsel to a client convicted earlier in the year of murder-for-hire. The trial occurred while McAllister was dealing with his possible disbarment. "At the time . . . I did not recognize the extent to which my mental state had deteriorated" as a result of his remorse, McAllister wrote. 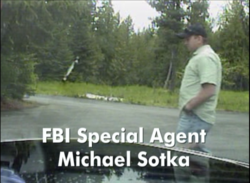 The prosecution team in this case was FBI Special Agent Michael Sotka, U.S. attorney Wendy Olson, and Prosecutors Traci Whelen and Marc Hawes. Federal Judge Winmill presided over the 2011 trial.